There is a small cafe and health food shop right here in Waikiki that has been providing the most essential of services since we arrived in Honolulu a few weeks ago. Simple, healthy, delicious and inexpensive take out dishes for green lovers like me. The cafe is called Ruffage Natural Food and it is not a trendy vegan joint by any stretch of the imagination, quite the opposite in fact. They run a simple show. You can come for a healthy smoothie in the morning, and a selection of salads and hot bowls for lunch or dinner. But the ingredients are fresh, of the right kind and in the right combination such as Chicken teriyaki on a bed of lettuce, avocado, alfalfa sprouts, tomatoes, carrots and yummy vinaigrette dressing. Miso soup. 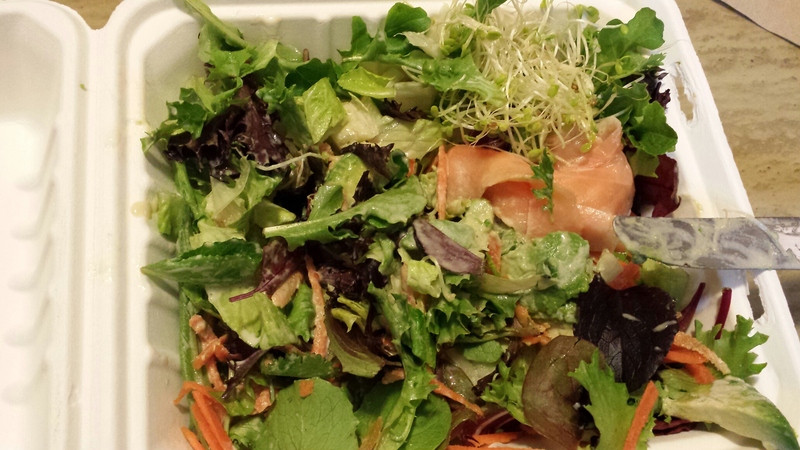 Salmon on a bed of lettuce, avocado, alfalfa sprouts, tomatoes, carrots and yummy sesame dressing hot food. Miso soup. 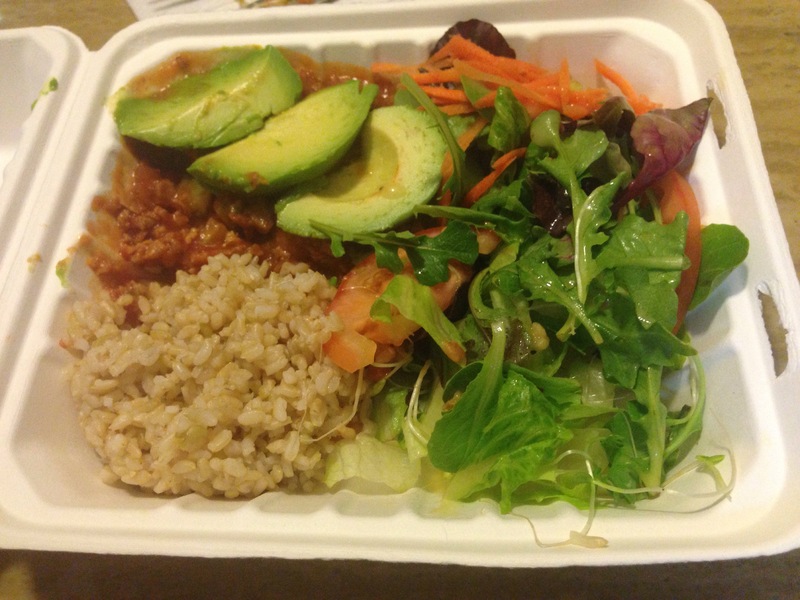 Vegan chilli with brown rice, bed of lettuce, avocado, alfalfa, tomatoes and carrots. Miso soup. Vegan lasagna on bed of lettuce, avocado, alfalfa sprouts, tomatoes, carrots. Miso soup. You get the picture. As Ruffage is situated about two minutes walk from where we live I tend to leave the house at five to seven and return ten minutes later, laden with biodegradable take out boxes that are sturdy enough for nothing to leak out. 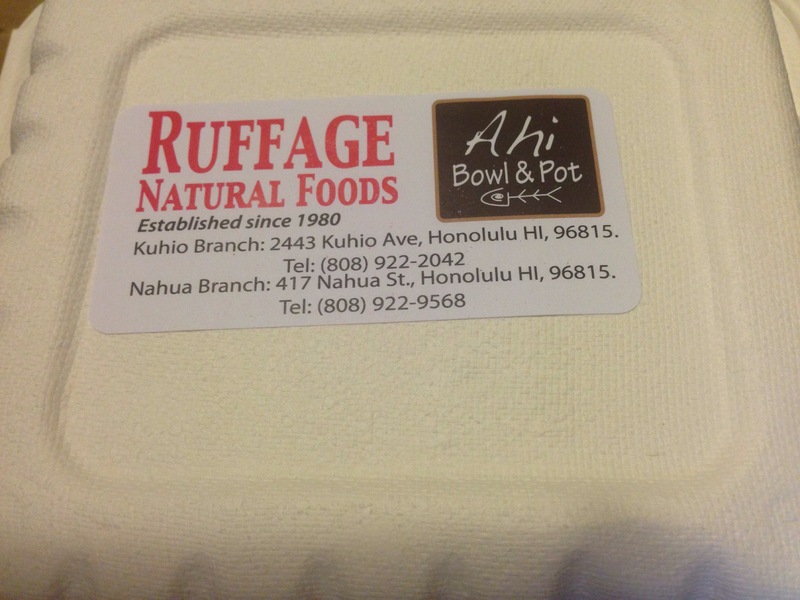 In a world of fast food restaurants in a land of giant portions, Ruffage has provided us with nourishing and healthy green food (and a bit of meat) without having to plan, shop and cook. The question I keep asking myself is this. Why does a place like Ruffage not exist on every high street in the UK? If it can be this easy and this cheap to eat well – why do we still eat paninis and triangle sandwiches from coffee chains? And you can’t beat that Ruffage hospitality !!! !